An Art Auction House Associate Specialist works full time in an art auction house to catalog auction sales in a specific department, such as cataloging fine arts sales in the Fine Arts Department. An Art Auction House Associate Specialist has an undergraduate degree in art as a minimum requirement. In addition to a college degree, having several years of work experience in the art field are often required, and can include gallery or museum work, archival work for an artist, or an internship in an auction house. An Art Auction House Associate Specialist is an expert in a specific area of art that the auction house deals in, such as Medieval art. A Specialist is a thorough researcher and can examine works of art and to research and catalog sales. Conducting library research, and writing condition reports, catalog blurbs, notes, and descriptions, plus contacting and communicating with other art experts are some of the main duties of this position. A Specialist also works through all the stages of publishing a catalog, adhering to the strict publication deadlines: scheduling the photographs of the art objects and obtaining photographic copyright, editing and proofing the text, and color-proofing the images and catalog layout. An Art Auction House Associate Specialist’s duties involve sales tasks such as setting reserves, assisting with condition reports, marketing sales and recording underbidding and bidding. A Specialist evaluates the works of art for appraisals and auctions. Post-sale duties include processing sales and unsold lots, and coordinating with the various in-house departments to complete the process. A Specialist builds relationships with collectors, dealers, and museums, and develops new client contacts to achieve potential future sales while nurturing customer loyalty. A Specialist communicates in various ways, such as by telephone or with written estimate requests or directly in person with walk-ins. 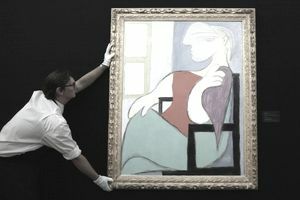 An Art Auction House Associate Specialist is organized, fastidious to detail and can prioritize tasks and meet deadlines. A Specialist needs to establish close relationships with a wide range of people, so must have superb interpersonal skills. As a dynamic communicator, a Specialist is an expert in both the spoken and written word. Major art auction houses often post their current job listings on their websites. Also, art schools and universities, and online job sites post art employment opportunities. Qualified applicants are usually required to submit their cover letters and resumes to the personnel department (HR Dept.) of the auction house.